NOAA has recently (2013) announced that printed nautical charts are being discontinued. However, there are many options for printed charts, mostly geared to fishermen, as well as electronic versions of charts embedded into the systems of GPS and combination GPS/Sonar units for boats. If you’re looking for a good fishing chart that’s detailed enough to give you some aid to navigation, try the ones from Florida Sportsman or from Waterproof Charts. And if you’re not satisfied with the detail on your onboard GPS unit, consider upgrading to Navionics charts. 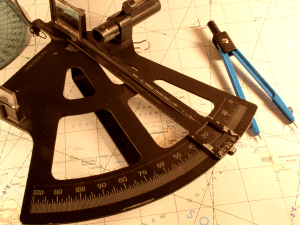 Boat U.S. has a good article about the use of navigation charts. Take a look at “Chart Reading 101” by Don Casey.